A photo from "The Cryptic Ones" exhibit at the Schuylkill Center for Environmental Education this month. | Photo by Brandon BallengéeSo much of life is out of view. Looking down at a forest floor we see tree bases, some bushes, leaf litter. We don’t easily see the enormous fungi networks that make up the healthy forest soil. We miss the hordes of tiny bugs eating leaf litter, the fungi and each other. And we can completely forget the cryptic little predators that are the lions, the tigers, the eagles of this world. Take, for example, salamanders. Even when we catch a glimpse of the lowly red-backed salamander, it’s too tiny to take seriously. Collectively salamanders help keep their vast food webs in balance, but they’re too easy to write off as little critters who squirm out of view. "The Cryptic Ones," an exhibition at the Schuylkill Center for Environmental Education, challenges us to take another look. These scanned salamander portraits by Brandon Ballengée, an artist and professor at New York’s School of Visual Arts, show salamanders at a scale we can appreciate. 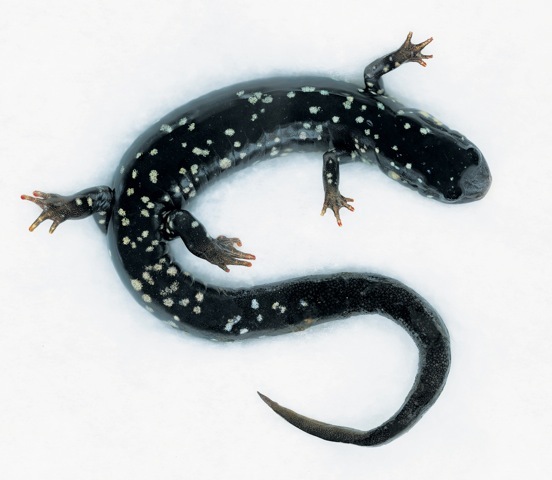 There are candy-orange northern red salamanders, red-spotted newts and black slimy salamanders flecked with shimmering silver dots like stars against the night sky. Amphibians worldwide are under siege. In the past 50 years we’ve seen more than 30 species go extinct. Another couple hundred are in steep decline. But it’s hard to care when they’re so easy to miss. Check out Ballengée’s work at the Schuylkill Center through March 16th and come away with the awe and appreciation these beautiful, ferocious creatures deserve. BERNARD BROWN is an amateur field herper, bureaucrat and founder of the PB&J Campaign (pbjcampaign.org), a movement focused on the benefits of eating lower on the food chain.